Cowley College hosted the 12th annual Arts & Humanities Day in Arkansas City on Wednesday, February 22. A total of 84 students took part in the event. Those attending Arts & Humanities Day had the opportunity to compete for scholarships, prizes and awards. They also got to take in performances, tour the school’s music, theatre and arts programs, and interact with current students, faculty and staff. “The students had a good time and the different areas of the College put together a great event to entice students to come to Cowley,” Marcus Hicks, interim executive director of enrollment management said. Hicks also praised the work admissions representative Brandi Gibbs did coordinating the event. Graduating seniors were eligible for Art & Design, Mass Media, and Creative Writing Scholarships. Senior Division, Best of Show 2D, Josie Krout, Ark City High School. Senior Division, Best of Show 3D, Bailey Bergagnini, Winfield High School. Junior Division, Best of Show 2D, Sarah Kuefler, Arkansas City High School. Junior Division, Best of Show 3D, Peyton Rising, Arkansas City High School. Drawing, Sidney Nittler of Ark City took first place; Francisca Posadas of Ark City High School took second place; Alexis Van Dyke of Bethany High School took third place. Graphic Design Single Page, Sierra Weatherman of Winfield High School took first place. Sculpture, Ashley Marie Smith of Winfield High School took first place; Bailey Bergagnini of Winfield High School took second place; Sierra Weatherman of Winfield High School took third place. Mixed Media, Jesus Sotelo of Wichita West High School took first place; Raquwon Brazil of Wichita West High School took second place; Natalie Delgado of Winfield High School took third place. Painting, Tiphanie Medina of Ark City High School took first place; Josie Krout of Ark City High School took second place; Ashley Marie Smith of Winfield High School took third place. Photography, Ashley Marie Smith of Winfield High School took first place. Portfolio, Sidney Nittler of Ark City High School took first place; Josie Krout of Ark City High School took second place; DeAngelo Tate of Winfield High School took third place. Senior Division, Best of Show in Creative Writing Portfolio, Quinn Johnson of Arkansas City High School took first place. Junior Division, Best of Show in Creative Writing Portfolio, Grace Nightingale of Ark City High School took first place. Poetry Writing, Quinn Johnson of Arkansas City High School took first place; Grace Nightingale of Ark City High School took second place; Markie Swanson of Ark City High School took third place. Short Stories/Fiction, Grace Nightingale of Ark City took first place; Ivy Johnson of Oxford High School took second place; Markie Swanson of Ark City High School took third place. 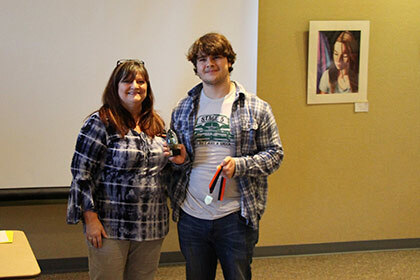 Screenwriting/Flash Fiction/Novel Chapter, Jayden King of Wellington High School took first place; Ashley Smith of Winfield High School took second place; Noah Powell of Douglass High School took third place.